Over the last four decades, Clarence Clemons’ inimitable saxophone playing was as much a part of Bruce Springsteen’s E Street Band sound as its leader’s anthemic choruses or tales of finding the glory days in an otherwise downtrodden existence. Rockfeedback was extremely saddened to hear of his passing, and offers this collection of ten of his finest moments by way of tribute. 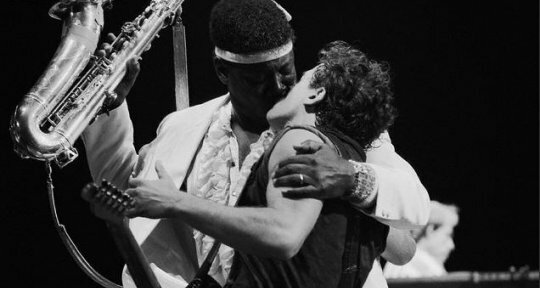 Over the last four decades, Clarence Clemons’ inimitable saxophone playing was as much a part of Bruce Springsteen’s E Street Band sound as its leader’s anthemic choruses or tales of finding the glory days in an otherwise downtrodden existence. Rockfeedback was extremely saddened to hear of his passing on Saturday night at the age of 69 after complications from a stroke, and offers this collection of ten of his finest moments by way of tribute. Disc 2 of definitive concert collection Live 1975-85contains this eviscerating live version of the opening track from 1978’s ‘Darkness On The Edge Of Town’. Springsteen unleashes intoxicating defiance in the face of the tribulations of the daily grind (‘I don’t give a damn for the same old played scenes…’). His backing group, meanwhile, have rarely sounded this fired-up. Classic Clemons moment: 2 mins 53 secs, a solo pre-empting one of The E Street Band’s most gloriously insubordinate crescendos. Classic Clemons moment: The introductory sax blare that establishes a deceptively upbeat feel to one of The Boss’ most overtly political statements. An exuberant, Van Morrison-influenced seven minute paean to the first joyful flushes of youthful romance, this track showcases The E Street Band at their most energetic and optimistic. Classic Clemons moment: 1 min 8 seconds, shortly before Bruce declares ‘Rosie you're the one’ for the first time. An irresistible, good time rock n’ roll salute to perennial Springsteen interests - cars and girls – and a long-term favourite of the Rockfeedback team. Classic Clemons moment: 2mins 28 secs, the Big Man’s euphoric solo brings the tune to a buoyant close. The abiding 80s synth riff and celebrated video starring Courtney Cox camouflage a deep melancholy sentiment, as the demands of pop superstardom began to weigh heavily on its author. Classic Clemons moment: 3 mins 24 secs, as a suitably mournful outro closes the penultimate track on this hit-laden Reagan-era opus. Many have attempted to set the frustrations of the working week to music, but few have ever improved on this rollicking repudiation, fuelled by Clemons on the band’s breakthrough album. Classic Clemons moment: The whole thing – one of the great ensemble works in the E Street Band’s back catalogue. The E Street Band were re-united on this cathartic post- 9/11 exposition after almost two decades: this is one of the more straightforward moments. Classic Clemons moment: 3 mins 33 secs. A vintage Clarence tenor riff. On a schizophrenic double LP that veers between high-spirited revelry and lugubrious melodrama, a Phil Spector-informed ode to restless souls represented one of its more classically pop flashes. Classic Clemons moment: The preliminary sax blasts in the first verse. Almost ten minutes in length, the gloriously cinematic curtain call on ‘Born To Run’ remains a simply staggering achievement.